In search of an effective way to lose pounds, I stumbled upon a revolutionary health cooker. A media launch was held at Shangri-la hotel, a detailed discussion about a two-year old product from Malaysia was presented. 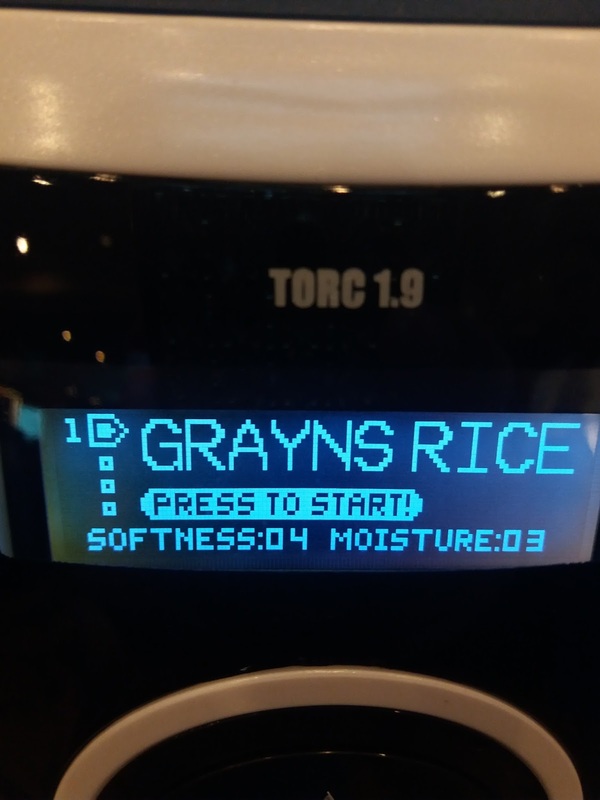 Grayns rice cooker; sounds like grains, so I thought. Could this help prevent obesity or possibly be the answer to our health problems? Read on to find out. Grayns is the only one of its kind. 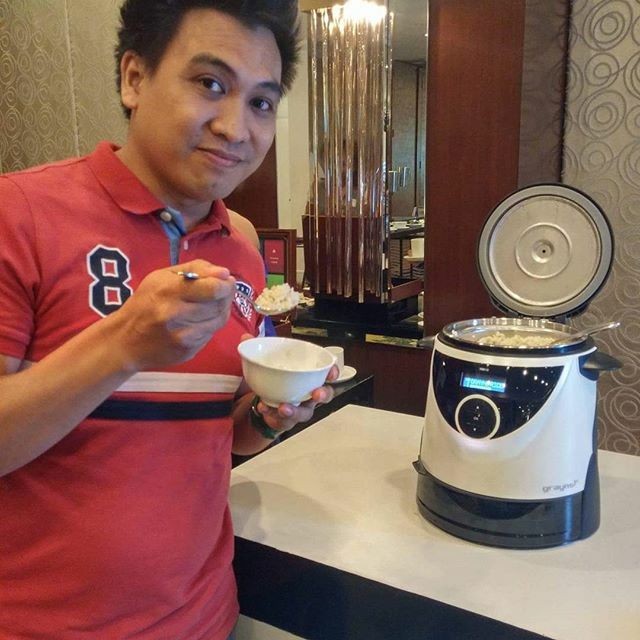 This invention is from Malaysia and in a recent study conducted, the said country ranks the highest in obesity rate across Asia and the Philippines is at 4th place. Is carbs bad? Should we remove it completely from our diet? Carbs are classified into two: Rapidly Digestible Starch and Slowly Digestible Starch. Rapidly Digestible Starch (RDS) is absorbed fast in the bloodstream giving way to a spike in the glucose levels whereas the Slowly Digestible Starch (SDS) is absorbed slowly, our body's energy level will rise gradually and it makes you feel full for longer. Oats contains SDS. Uncooked grains like rice, wheat and barley also has SDS but if cooked improperly, it releases RDS. How does Grayns rice cooker work? It actually is similar to how we traditionally cook rice. 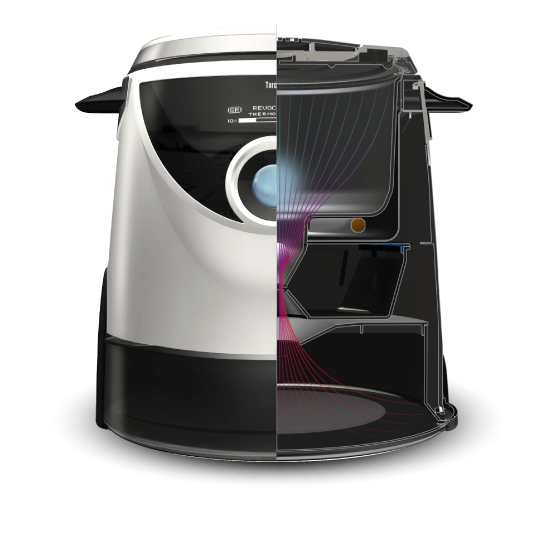 Excess water after boiling is removed from the conventional rice cooker since starch is in the water. However, effectively removing starch the through the traditonal method is a long and tedious process which takes about three hours . 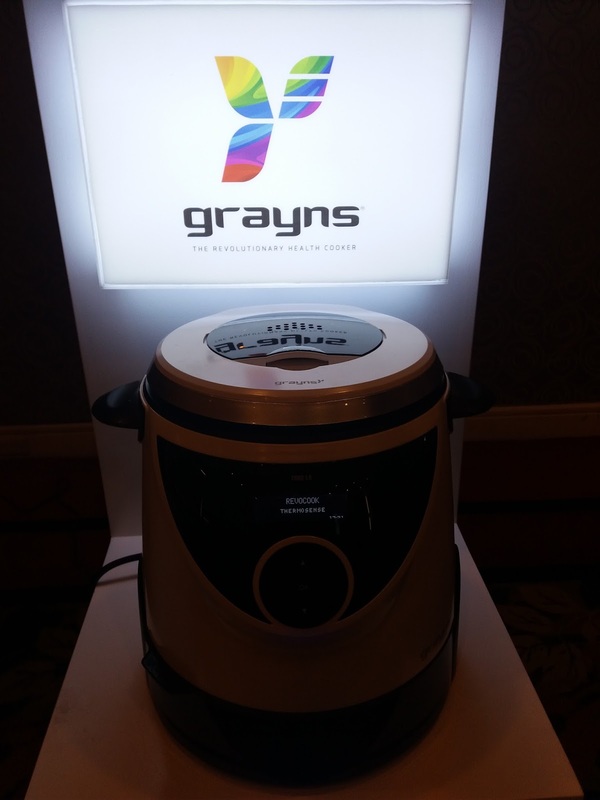 Grayns rice cooker automatically cooks rice in forty minutes in such a way that it produces SDS or Slowly Digestible Starch. The processes involved in cooking are: Thermosense - wherein a low temperature pasteurization occurs to gelatinize the rice to release the RDS into the water. Next stage is Debond - where the temperature is maintained for gelatinization to continue so that most of the RDS is rid out. After that, RDS is Transuded or in other words, discharged through the tiny membranes below the cooker and drained into a Starch collection tray. Last stage is Demoisturize to make the rice fluffy to reach its full volume and in turn makes you feel full, it also removes excess moisture to prolong the life of rice of up to 5 days or more when left outside at room temperature in a climate like ours. 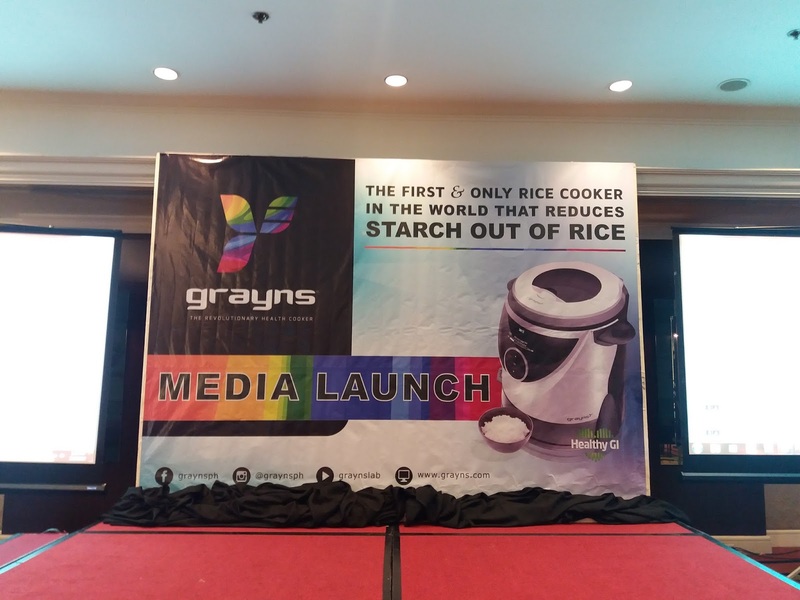 In comparison, rice cooked in Grayns rice cooker has 30-35% lower on the Glycemic index which translates to a healthier alternative not just for Diabetics but also for people with Heart disease, Obesity, premature ageing, high cholesterol levels, and Cancer. 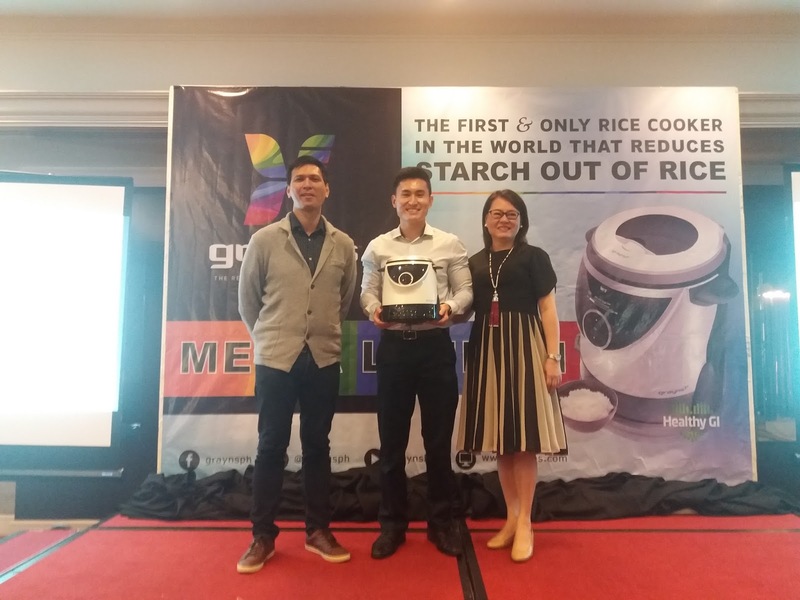 An added and notable feature of the product is the ability to control the moisture and softness of rice that means it is best for any variant of rice: white, red, brown, or black. It can even cook vegetables and native Filipino delicacies. For now, there is only a single model of this apparatus but variations like one with a bigger capacity will be available in the future. 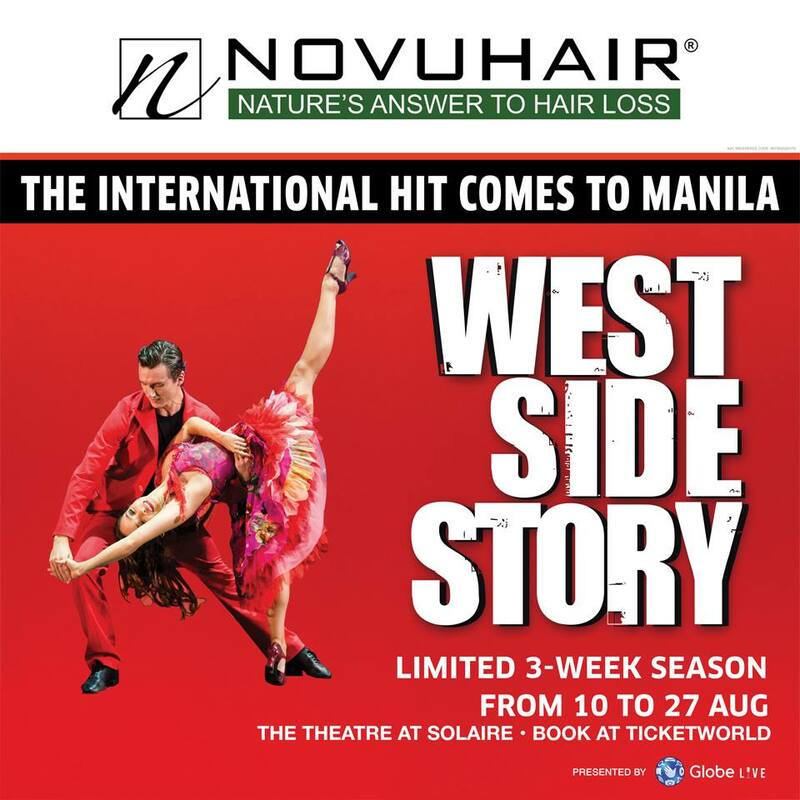 It can be purchased for Php27,000 and is retailed at Abensons and Rustans in Metro Manila and it can be purchased in Cebu and Davao as well. Is a healthy product worth the buy? Crash dieting can never be a sustainable solution to our health woes, a lifestyle change is and personally, I am sold at this invention. Cebu Pacific Backpacking Challenge Winner : Davao Team! Juan for Fun Team Juanton members Geia, Dominic and Chin take home the grand prize of one-year travel-all-you-can passes to Cebu Pacific’s local and international short-haul destinations. Three graduating college students from Davao City won the Juan For Fun (JFF) 2017 Backpacking Challenge, each taking home a Cebu Pacific Travel All-You-Can pass for unlimited local and international short-haul destinations for one year, plus pocket money from co-presenters GetGo and Union Bank. The three students—18-year-old Gloria Andrea Mendoza; and 19-year-olds Christian Dominic Ang and Chyn Ira Crisostomo, comprised Team Juanton in the annual event presented by Cebu Pacific, the Philippines’ leading carrier. OVERJOYED. After seven days of setting off to an adventure of a lifetime, Team Juanton of Davao is named Cebu Pacific’s Juan for Fun 2017 Ultimate Backpackers. A WHOLE NEW ADVENTURE. Juan for Fun Team Juanton members Geia, Dominic and Chin take home the grand prize of one-year travel-all-you-can passes to Cebu Pacific’s local and international short-haul destinations. “The Philippines is a beautiful country and many Filipinos have not had the opportunity to explore their own country. Juan For Fun is our way of advocating travel within our own country—especially for young Filipinos. There is much to see and do in the country and this one of the reasons why we continue to expand and offer flights to destinations in the Philippines. We want to make air travel easy, affordable and accessible for everyJuan,” said Charo Logarta-Lagamon, Cebu Pacific Air corporate communications director, as she congratulated the finalists. Find out the best way to travel across the Philippines with Cebu Pacific. Retrace the adventures of the Juan for Fun Backpacker Challenge 2017 teams by visiting www.facebook.com/ cebupacificjff and stay updated on the airline’s new and exciting programs by following Cebu Pacific’s official Facebook and Twitter (@CebuPacificAir) pages. The Philippines isn't new to natural disasters or calamities. Compared to its other Southeast Asian neighbors, our country experiences a wider range of disasters. From floods to landslides, and typhoons to earthquakes – the most recent of which just happened in Leyte with a magnitude of 6.5 – the Philippines continues to endure and survive. Though the government does its best in preparing for and anticipating these times of emergency through awareness efforts and disaster response drills, self-mitigation is still an area that we can further improve on. Surendra Menon, CEO of the country's premier bancassurance company, BPI-Philam, learned from the resiliency of Filipinos and their experience in times of crisis, believing this has given them a good start in disaster preparedness. Despite this vast experience of the nation, Menon encourages practicing resourcefulness by taking notes from disaster responsiveness of other countries in the region. Having worked and lived in Indonesia, he recalls the massive 1989 earthquake that hit its West Papua region, where countless people died and survivors ran out of supplies in a few months’ time, remaining displaced years after the incident. He believes Indonesians and Filipinos are somewhat similar given their experiences, but Filipinos can up their preparedness by starting with themselves. "Disaster has a long-term impact, but only short-term assistance will come so it's up to you to bridge the gap between short-term assistance and long-term necessities," he stressed. Menon, who served as a Lieutenant Captain for Singapore’s Civil Defense Forces, shared some practical tips that could help anybody self-mitigate in times of disaster. "On a physical basis, make sure you have two weeks’ worth of water in your house. 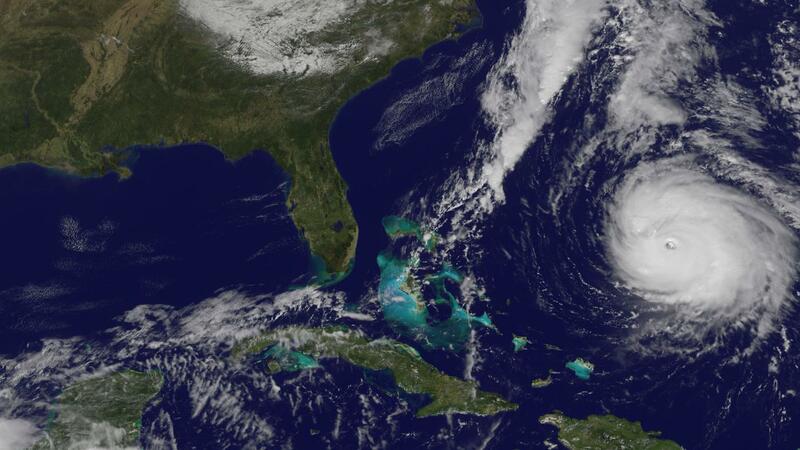 The first and foremost necessity for survival is water," Menon said. "You will need food – dry food like biscuits that can last for two weeks as well for you and your family should be enough to go around when a disaster strikes and until help comes." Apart from physical needs, he also reminded Filipinos to have available cash at hand for emergency purchases and backup funds in the bank. "Maintaining an insurance plan would help too," he said. "Prioritize protection from accidents first, then your health and life [insurance]." Starting and maintaining financial contingency plans may not seem to be a priority for the average Filipino worker, but Menon believes foresight is a good thing to have, not just for ourselves but for those who matter to us most. "The order of priority for your funds should be ‘today’ first and then 'immediate emergency,'" he said. "The next priority after that should be protecting your future income, preferably through a life insurance plan, so your family won't have to worry about resources should something happen to you." Confident of the Filipinos’ indomitable spirit – the driving force against some of the worst natural and man-made disasters that hit the region – Menon is convinced the Philippines can only get more resilient through learnings from past calamities and ensure enough preparation for life’s uncertainties. MAKATI City Philippines - Bank of the Philippine islands officially launches its micro finance bank, BPI Direct Banko, Inc., or BanKo. The micro finance bank is the result of the merger of two specialized thrift bank units of BPI-BPI Direct Savings Bank Inc. and BPI Globe BanKo. Banko will serve self-employed micro entrepreneurs (SEMEs) running their small businesses. Aside from providing SEMEs affordable and appropriate loan products, Banko aims to empower SEMEs with expert financial advice and solutions that promote the growth and expansion of the SEMEs' enterprises. In a media launch today, BanKo Chariman Nabble Alejo said Banko supports the country's vision of financial inclusion by strengthening the financial capability of a sector that rarely has access to formal banking. BanKo recently opened 15 new branches in key areas around the country, including Bicol, Negros Oritental, Davao, and Central Luzon bringing the total number of branches, nationwide to 24. By October 201, BanKo aims to have 90 branches nationwide. 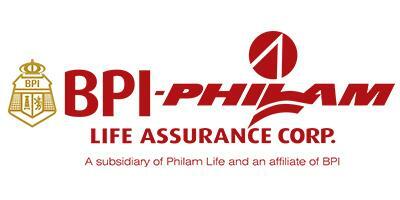 “At BPI, we proactively listen and always strive to address the financial needs of all clients across sectors. 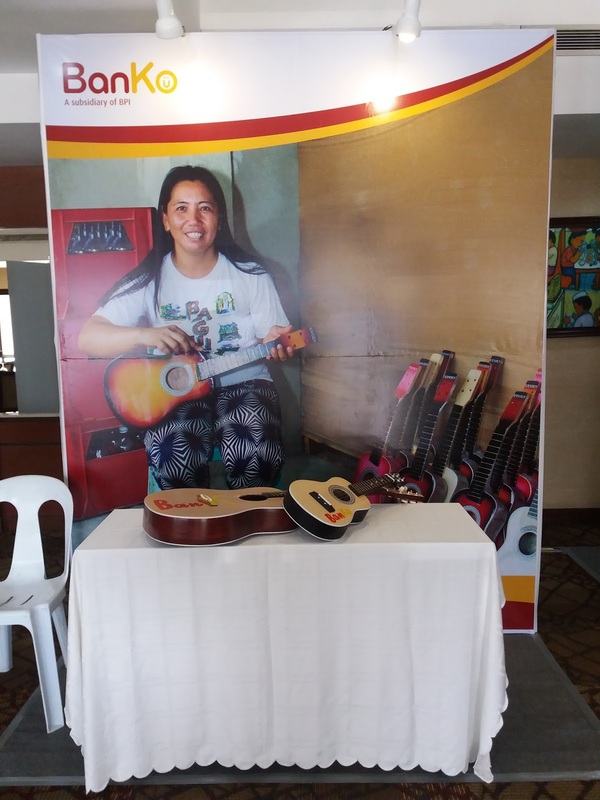 BanKo is a major effort in reaching out to the unbanked and underserved individuals,” said BPI President and Chief Executive Officer Cezar P. Consing. BanKo clients are guided by financial advisors called BanKoPares and BanKoMares - loan officers who engage SEMEs and help them choose the best products and solutions to help scale up their businesses. These friendly and approachable bankers help clients manage their finances and give expert financial advice. 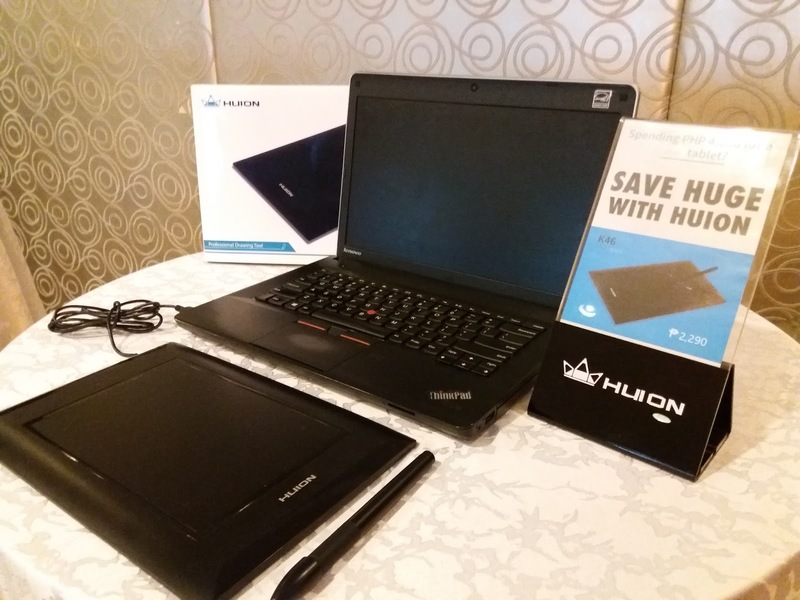 Huion has arrived in the Philippines and is now partnering with American Technologies Inc. (ATI) as its sole distributor in the country. It is well known maker of high quality and affordable products. For more than a decade, Chinese tech solutions Huion has been commited to digital animation drawing technology and it is now growing to be one of the biggest manufacturers of handwritten input digitizer products such as graphic tablets, pen tablet monitors and others. Huion offers quality products at low prices. A basic drawing tablet would only cost as low as Php2,290. The HUION K46 is an entry level tablet with high quality and 1 year warranty. It is way cheaper than other brands which are commonly priced at Php5,000. 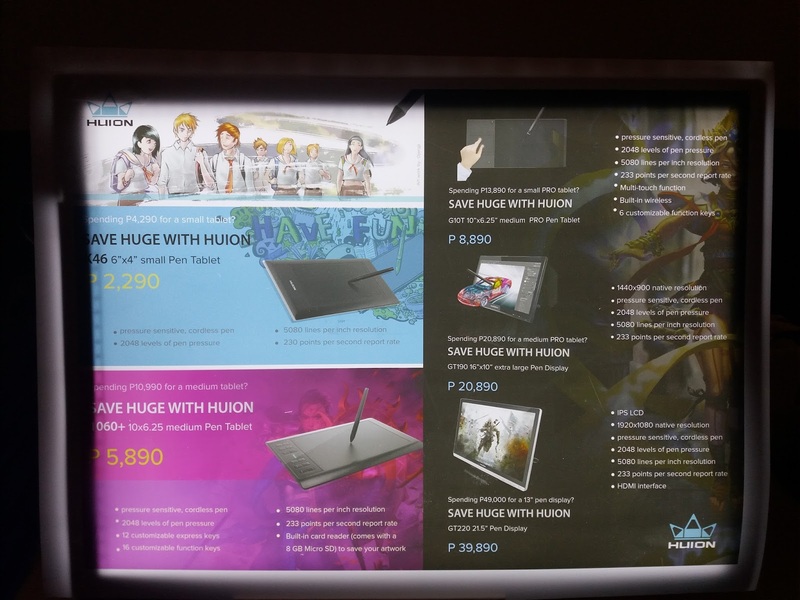 The Huion 1060+ costs only Php5,890 compared to Php10,000 with other brands. That's a huge amount of savings! For users who likes drawing directly on the screen, the Huion Pen Tablet monitor will fit their needs. This pen tablet is priced at Php38,890. Imagine saving as much as Php10,000! 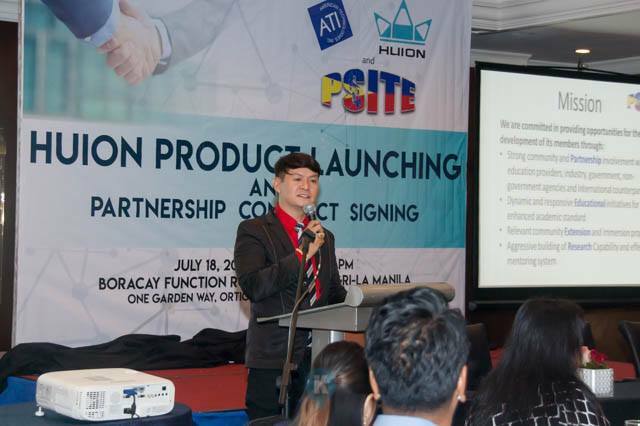 Huion and Philippine Society of IT Educators (PSITE) recently entered partnership at the product launch and contract signing held at Edsa Shangri-la Manila on July 18th, 2017. This equips students with quality and affordable pen tablets, interactive pen displays and digital interface solutions. Our Lady of Fatima University also signed contracts with Huion and ATI, thus maintaining its commitment to provide quality education. 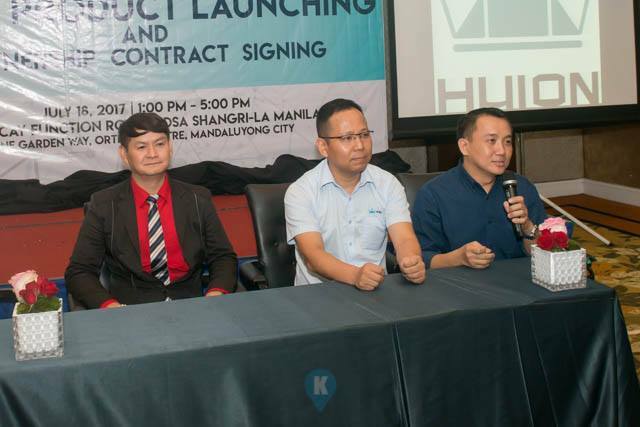 In the same event, Huion and the Animation Council of the Philippines had a contract signing too. 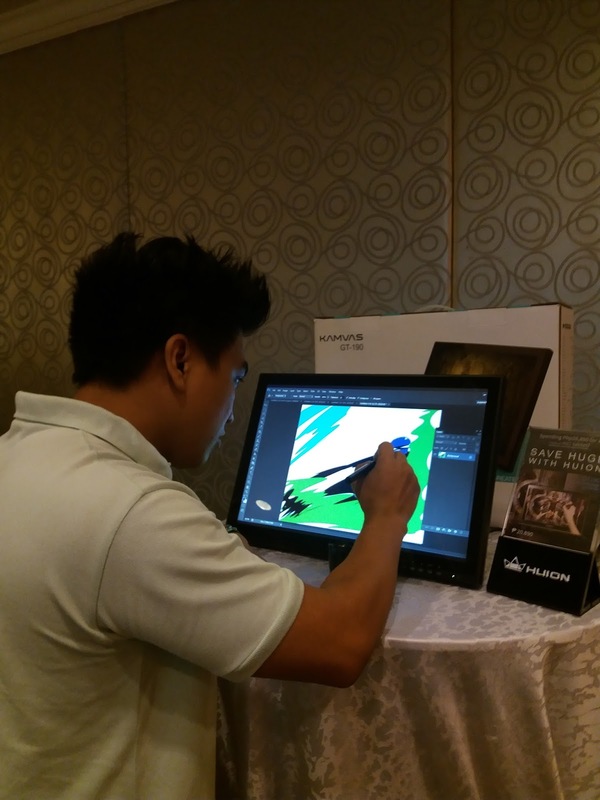 Huion drawing tools will be available in the Philippine market very soon under the exclusive distributorship of ATI. The history of denim goes way back to the Gold rush in the US. Workers needed pants that will stand a whole day of hard labor. Funny how it all started. Fast forward to present time, denim is a part of the American culture as well as ours. It can be worn for casual or even in formal occasions to get that rugged look. What is your oldest piece of denim wear? What denim piece do you love the most? Angela, Adela, Ina, and Janny of “Philippines’ Next Top Model (PNTM): High Street” when asked had interesting stories to tell about their well-loved and cherished denim pieces. Recently, these four strikingly beautiful ladies were hailed the best among the 12 finalists of the country’s premier model-making fashion reality show. Landing on the top spots of the competition continues to open a more doors for the girls. One of their latest exciting engagement is to be the alluring faces of SM Denim Days – a month-long denim festival offering shoppers great denim finds and exciting events in 63 SM malls nationwide. Find out what is next for these ladies as they also share their denim stories. Prior to wining PNTM Cycle 2, Fil-Swiss Angela was an interior design student who enjoyed a little bit of farming. She is a vegetarian and likes to eat organic. Though Angela was not really into modelling before she joined the competition, she wanted to prove that having a condition like scoliosis did not hold her back from pursuing a career in the industry. She dislikes using single-use plastics or disposables utensils, straws and water bottles. Now that she’s the newest ambassador of SM Woman, she wants to use her voice to raise awareness on environmental concerns such as waste management and animal rights. The oldest denim piece she owns is a denim jumper. “Actually, I’m unsure if the jumper is mine or my sister’s,” said Angela. She just knows that they have been arguing over it for years now. The PNTM Cylcle 2 winner also loves a good denim jacket. “It never goes out of style and goes with almost goes with every outfit,” she added. Modeling was never part the plan when Adela’s family moved to the Philippines last year. The youngest of the 12 finalist, Adela only did one fashion show as a favor to her mom’s friend that somehow led her to doing seven commercials before joining PNTM. Though she turned down a lot of modeling opportunities in her early teenage years due to lack of interest, Adela was eventually inspired by her mom who formerly did modelling and acting in the Philippines back then. Her oldest denim is a pair of flared/bootleg jeans that she got from her mom. “It just proves that fashion comes in cycles and good denim never goes out of style,” said Angela. She is also fond of denim jackets because they can immediately dress down a nice outfit but also can give it a bit of swag. Ina may not look like your typical Filipina, but she is 100% Bicolana. When she was younger, she used to spend summer vacations with her family in the Bahamas where here parents both worked as nurses. She has always enjoyed the beach and the salty breeze and sand in her hair. Ina was 17 years old then when she started joining beauty pageants, bagging already a couple of titles until she tried national competitions. Ina was one of the top 13 finalists in the 2014 Miss World Philippines, and a candidate of the 2015 Binibining Pilipinas. Now, she’s taking time to pursue her Master’s Degree in Business Administration. She owns a denim jacket she has had since high school. “It was a Christmas gift from my Ninang. You see that is the best part of denim, it will never go out of style,” said Ina. Among other denim pieces, she favors ripped jeans the most because they look edgy, matching best her personality. Since she loved watching America’s Next Top Model when she was a kid, being part of PNTM was a dream come true for Janny. Before joining the competition, she was already a full-time model for various events and commercials. According to her, she is doing all this for her son. Janny aspires to become a celebrated androgynous model in the country. She aims to continue her modeling career, especially after her valuable exposure from reality show, and also maybe one day become a flight stewardess of an international airline. When asked about her oldest denim piece, it was a pair of blue denim pants. “It’s from my eldest sister. [She] passed it on to my second eldest sister, then passed on me. The pants are already 8 years old,” explained Janny. She is also fond of tattered denim pants. “They give off a laid back and relaxed vibe that is similar to my personality,” she added. Like the final four of PNTM Cycle 2, most people would find themselves nurturing a mysterious and emotional bond with their well-loved denim. Denim wear has evolved over the years to provide both functionality and timeless style. What once started as a rugged workwear, denim now became a wardrobe staple, ranging from denim jeans of various cuts to shirts, shorts, jackets, and skirts – becoming also an expression of the wearer’s mood and personality. To find out more about Denim Days at SM and for exclusive news about SM Supermalls, visit www.smsupermalls.com or follow SM’s official social media accounts on Facebook, Twitter and Instagram; and get an insider access to all the fun happenings at SM Supermalls nationwide through SM’s Viber Public Chat. Tweet your thoughts, upload and share your photos about your memorable moments at SM, then use its official hashtag #EverythingsHereAtSM. Back-to-school is bound to get sweeter Griffin’s Cookie Bear biscuits and Res|Toe|Run Kids. Griffin’s Cookie Bear and Res|Toe|Run are making back-to-school season more delightful with treats you and your kids will surely enjoy. Goodies from New Zealand’s Favorite Biscuit Bakers, Griffin’s Cookie Bear, await those shopping at Res|Toe|Run. With every single receipt purchase of Res|Toe|Run Kids’ footwear, you can get a complimentary pack of Cookie Bear Hundreds & Thousands. Available in Pink and Chocolate Icing variants, and made with real New Zealand milk, these delicious biscuits are perfect for recess and after-school snacking. Get these freebies until August 9 in these Res|Toe|Run branches: UP Town Center, TriNoma, Alabang Town Center, Estancia Mall, Robinsons Magnolia, Harbor Point Subic, Nuvali, Abreeza Davao, and Ayala Center Cebu. 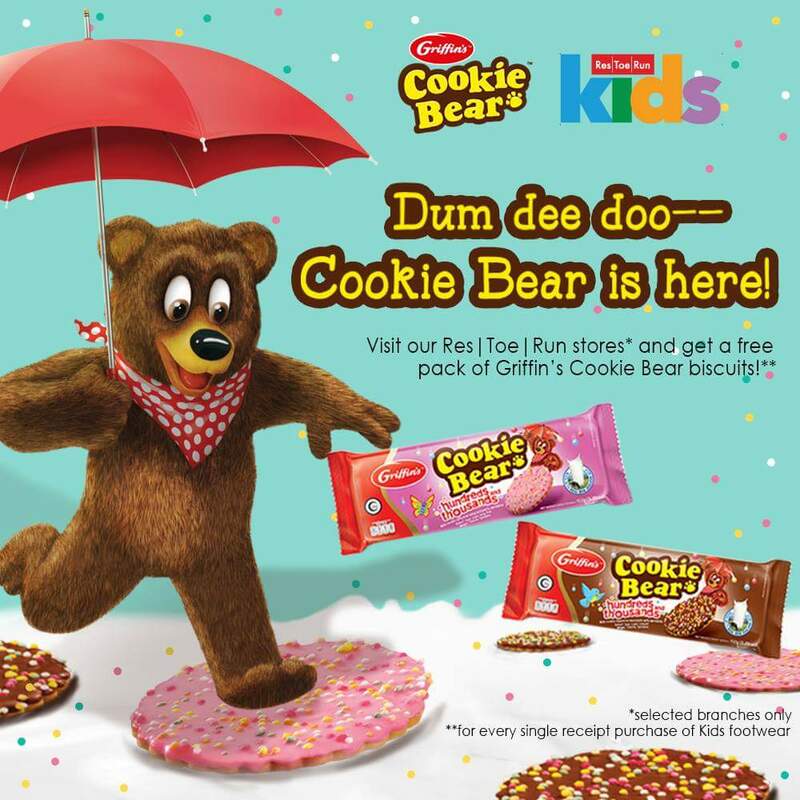 You and your little ones can also meet the adorable Cookie Bear mascot and get to play the Cookie Match tablet game to win Griffin’s Cookie Bear biscuits and other prizes. Mark your calendars and head over to these Res|Toe|Run branches: Robinsons Magnolia on July 2; Alabang Town Center on July 9; TriNoma Mall on July 16; and UP Town Center on July 23. To make back-to-school season even more fun and exciting, Griffin’s Cookie Bear and Res|Toe|Run will be giving away Php 1,000 Res|Toe|Run gift certificates to ten (10) lucky winners of its online promo. Learn more about this and other surprises on the Griffin’s Facebook page (www.Facebook.com/GriffinsPH). Share delightful moments with your kids, and make school and bonding time sweeter with Griffin’s Cookie Bear biscuits, and Res|Toe|Run Kids, a children-focused line of Res|Toe|Run, a fashion footwear “restaurant-concept” store. For more details, follow their Facebook and Instagram pages (@ResToeRunOfficial). Good habits are ones that are formed early in life and make a lasting impact on an individual’s core values. Such has been the idea behind Dole Philippines’ latest sustainability initiative, the Sunshine Heroes campaign—a CSR and sustainability drive centered on engaging the schoolchildren and instilling within them the passion to embrace sustainability, through recycling, as a lifestyle and a progressive movement. PARTNERS FOR SUSTAINABILITY. 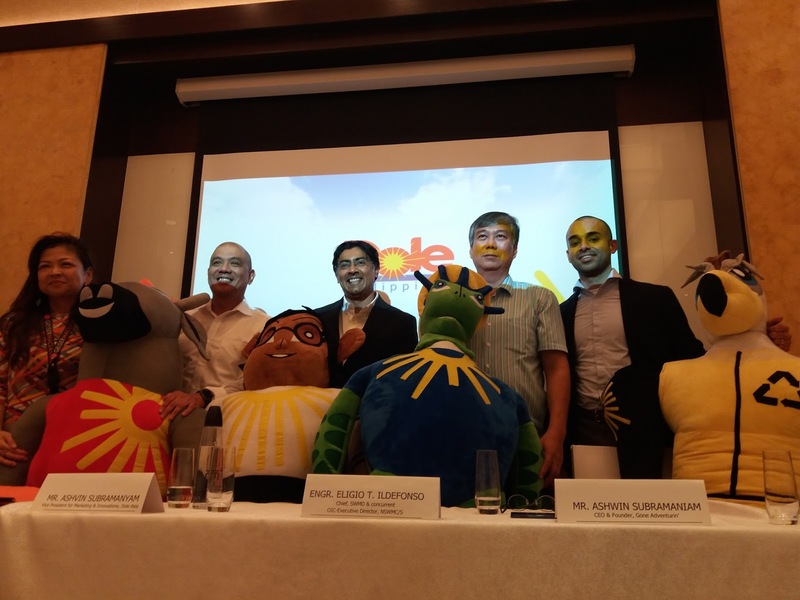 The launch of Dole Philippines’ Sunshine Heroes campaign is aimed at we are equipping the youth better to understand the importance of making recycling a life-long habit and advocacy. Gracing the launch of the brand’s CSR campaign last Thursday, July 13, 2017, at Fairmont Hotel in Makati City are: (L-R) Environment and sustainability advocate, Amor Maclang of GeiserMaclang Marketing Communications, Inc.; Noel Casanova, General Manager, Dole ASEAN Cluster; Ashvin Subramanyam Vice President for Marketing and Innovations for Dole Asia; Engr. Eligio Ildefonso, Officer-in-Charge of the National Solid Waste Management Commission-Secretariat of the Department of Environment and Natural Resources; and Ashwin Subramaniam, CEO and Founder of Gone Adventurin’. "Recycling is a habit that needs to form early. 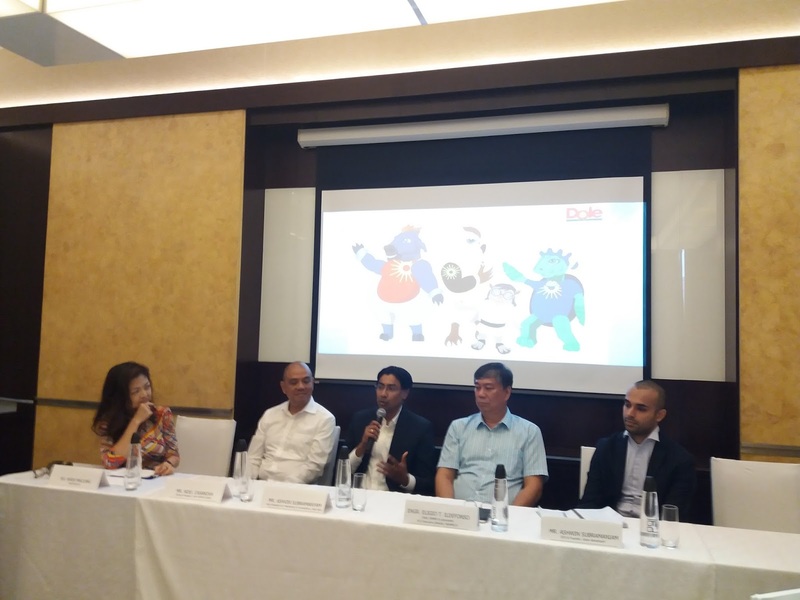 We need to teach kids that all the trash they see laying around our streets and clogging our waterways is because we need more recycling and less trash,” says Ashvin Subramanyam, Vice President for Marketing and Innovations for Dole Asia. The campaign draws inspiration from the power of the youth to influence their respective households to change behaviors, both as consumers and as sustainability advocates. “We chose to engage the youth because of their role in helping change mindsets about recycling and proper waste management,” explains Subramanyam. A program spearheaded in partnership with Gone Adventurin’ and Mother Earth Foundation, Dole Philippines’ Sunshine Heroes campaign involves putting up material recovery facilities (MRFs) in selected schools in Metro Manila. Students will be requested to bring household recyclable wastes to the facility. The trash will then be sold to local recyclers once it reaches a certain amount. Money generated from this program will go directly to the school to help fund other school activities. SPREADING THE SUNSHINE. Spearheading the brand’s CSR and sustainability movement are: (L-R) Noel Casanova, General Manager, Dole ASEAN Cluster; Engr. Eligio Ildefonso, Officer-in-Charge of the National Solid Waste Management Commission-Secretariat of the Department of Environment and Natural Resources; Ashvin Subramanyam Vice President for Marketing and Innovations for Dole Asia; and Ashwin Subramaniam, CEO and Founder of Gone Adventurin’. With its long-standing commitment to spread the sunshine for generations to come, Dole Philippines’ Sunshine Heroes campaign is reigniting the idea of household recycling by educating the youth and shaping them into future environmental leaders. The challenge behind the campaign stems from the fact that the current generation of young adults and household decision-makers were not raised in a recycling culture. Changing these habits, based on global experience, takes at least a generation. Part of Dole Philippines’ sustainability drive involves conducting a series of recycling workshops and forums aimed at educating kids about the importance of recycling. Another fun aspect of the campaign will be the introduction of four (4) recycling characters to promote a more engaging way for Filipinos to understand the idea of recycling and sustainability. Each character—inspired by endemic creatures here in the Philippines like the carabao, the Philippine Eagle, the pawikan, and the tarsier—represents a type of ecosystem that forms the core of Dole Philippines’ waste recycling initiative: trees, air, water, and land. Here in Southeast Asia, rapid urbanization posed a huge challenge among developing nations in terms of the enabling cities to meet rising demands for urban services, particularly in terms of proper waste management. This was partly the reason why, according to a recent study, a great portion of recyclable packaging materials around the world is used only once, while 95% of its total value (about $80-$120 billion/year) is lost to the economy. While the commercial community has embraced recycling, it has not caught on in many Filipino households, thus creating big waste disposal problems for the rest of the country. Household recyclable wastes have been among the biggest economic staples. Despite this, these materials also pose a serious threat to the environment due to the Filipinos’ lack of proper understanding about recycling. This problem may be attributed to the eventual rise of the “throwaway and convenience culture. The clamor for “convenience” among consumers has led to a lot of products being reduced to smaller packs, thus requiring the use of larger amounts of disposable—and recyclable—materials. In turn, this has resulted to the country ending up producing around 40,000 tons of garbage every day—a figure that easily translates to about 14.6 million tons per year. Experts say that at least 70 percent of these wastes are generated by households, while about 75 percent of this total amount can actually be recycled. “Public awareness and participation are vital keys to successful waste management measures, ends Subramanyam. “For us at Dole Philippines, recycling is all about embracing the idea of sustainability as a way of life and a sustained advocacy. By educating and engaging our youth, we hope that can help us champion recycling and, in the long run, build environmentally-responsible Filipino households.